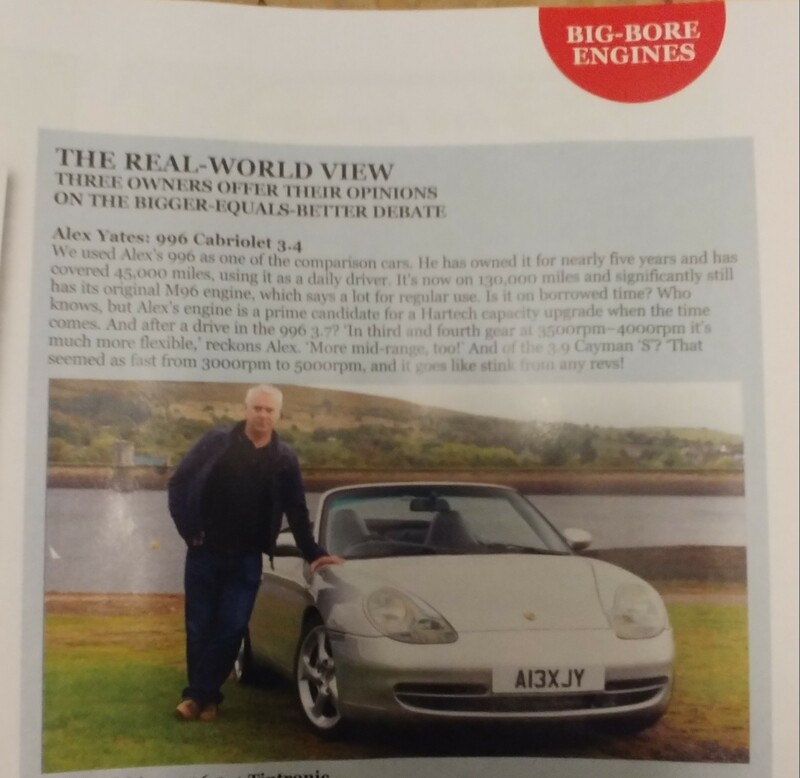 911uk.com - Porsche Forum : View topic - Hartech oversized engine testing with 911&Porsche World. 911uk.com Forum Index > Design, Gadgets, Safety & Technical > Hartech oversized engine testing with 911&Porsche World. Well there's this Saturday if you can make it Kris, although personally I'd wait for the Christmas PU round Manchester. Should be able to get a cheap hotel. I can't do this weekend, down in London with the family. I'd love to do a Christmas get together though, just need a date fixed for it. I will hopefully geta chance to try the 3.9 next time I am at Hartech, I will be doing engine work on my C4 when the suspension and bodywork are sorted. Hartech will be involved. Interesting views, will buy the mag and have a read. One thing I wonder about is this- the 3.4 is often considered the’sweeter’ engine vs the 3.6 as it benefits from revs. Does the bore out to 3.9 make it even more torquey and hence pointless to rev? Were I to have it done I would like to capture some GT3 magic... a more free-revving lively feel. Give me a call Waldron! The 3.9 is created by increasing both cylinder bore and stroke and although we don't have time or facilities to allow everyone expressing interest to test ours - we might make some exceptions for genuine parties ready to place an order. This is why we invited owners of standard cars as well as the test driver/editor and the article backs up why the conversion is so successful with proper technical explanations. We also tested 2 other would be go faster mods recently and both made the cars less powerful and slower - whereas our tests were just about as independent as they could possibly be.